is flawed since in the early 1800s England did not have any public schools (like those we attended in the 20th century), or that those who attended those public schools received free educations. There were some private elementary schools for the wealthy who paid the tuition for their enrolled children. Faraday believed he could change the bond angle of water in order to produce electricity (something John Ellis would ultimately do). Ellis was convinced he could permanently change the healthy attributes of water by permanently changing its hydrogen bond angle sufficiently to make the water we drink as healthy as the water which Adam and Eve sipped in the Garden of Eden. Two men, Michael Faraday and his 20th century twin scientist, John C. Ellis, began lifetime quests to permanently change the bond angle of the hydrogen in water—but with two distinct and entirely different core objectives in mind. Faraday succeeded with what he was attempting to achieve: create an electromagnetic field by changing the bond angle of hydrogen in water. His research on electrolysis led to the creation of electro-magnetism. Using a primitive electro-magnetic rotary devise, Faraday created the foundation of electric motor technology. 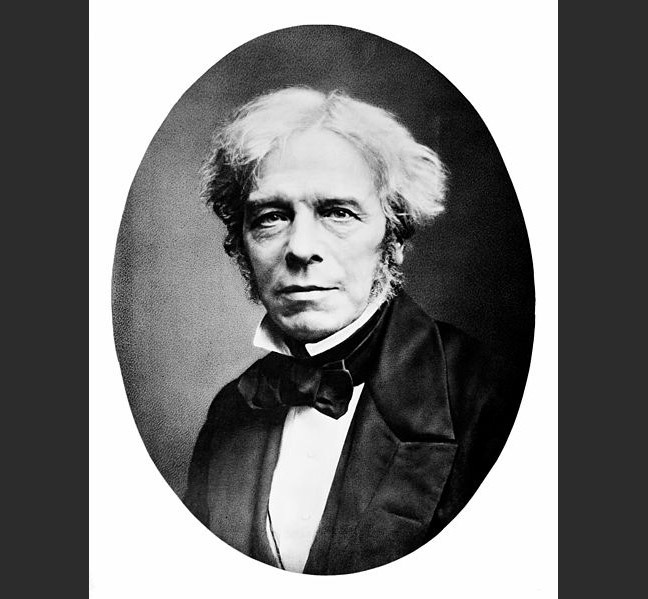 Changing the bond angle of the hydrogen in the water was what fueled Faraday’s electric power. John Ellis pretty much began where Faraday left off when he died. Ellis got his degree in steam plant design and environmental engineering at the University of Indiana. When you examine the history of these two men—Faraday and Ellis—it’s almost as though they shared the same brain in an expanded window of time. Faraday was the first scientist to discover nanoparticles of metal pollution in water. By distilling and re-distilling water over 100 times as he purified and re-purified the same water as many times, John Ellis changed the nature of water and brought it as close to the water in the Garden of Eden as any mortal man could. Just as Michael Faraday was one decade short of being born in the 17th century, and John C. Ellis was born 29 years short of being born in the 19th instead of the 20th. Nikola Tesla was born in the 19th. Unlike many of the brilliant scientific minds in the 18th and 19th centuries who were either self-taught, tutored at home or in a boarding school (which Faraday missed completely), John C. Ellis, who was born on May 29, 1929, went to an exclusive prep school (much like those quality prep schools attended by history’s famous luminaries like Humphry Davy, Thomas Brand, the 20th Baron Dacre, and scores of the offspring of the rich and famous 18th and 19th century Illuminati who attended some of America’s early prep schools like the famous Choate School for young men (founded in 1896 (which followed the creation of Rosemary Hall—a private school for women and orphans in 1890 whose husbands and or fathers died serving the blue and the grey during the American Civil War).